‘West’ is a bright little novel which is packed full of events and quite a lot of subtle humor. Author Carys Davies is from northwest England, but she has chosen to tell a story that takes place in the United States in 1815. Pennsylvania settler and farmer John Cyrus Bellman has read articles about the giant animal bones that have been found in Kentucky. We now know that these were prehistoric dinosaur bones, but Bellman thinks that these giant creatures must still be roaming the prairies and mountains out west. He decides to leave his motherless ten year-old daughter Bess in the care of his sister Julie and head out west searching for the giant animals. He will follow the same Missouri River route which the explorers Lewis and Clark used. At a trading post. he equips himself with trinkets to trade with the Indians he will encounter and with a stovepipe hat. Then early on in the trip, he picks up the teenaged Shawnee scout funnily named Looks Like a Woman From Afar to help him. From the scout, we get the Indians’ point of view of being cheated with trinkets and driven out of their own land by ruthless and dishonest white people. Everyone thinks Bellman is a ridiculous fool for going on his quest, but they don’t tell him that. Bellman writes several letters to his daughter Bess, but they all get lost or waylaid somehow before reaching her. Meanwhile back on the farm, a neighbor man named Elmer volunteers to help Aunt Julie and Bess to run the farm. The stories of Bellman on his western adventure and of his small daughter Bess left on the farm are told side by side in separate short chapters. What impressed me most about ‘West’ is Carys Davies’ economy of style. Davies gets more mileage out of her direct and straightforward sentences than any writer I know. Every word, every sentence has its purpose and drives the story forward. The novel is an adventure story, a domestic drama, and a wickedly ironic tale all rolled into one. 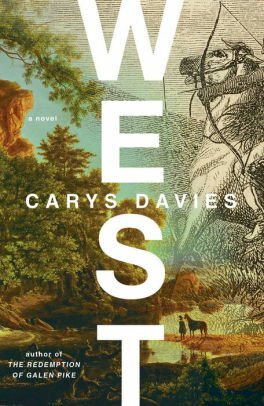 ‘West’ is Davies’ first novel, and it definitely is an auspicious debut. I hope it starts a new trend of substantial 150-page novels. The ending of ‘West’ is quite far-fetched, but Davies’ method of juxtaposing the two stories and finally bringing them together makes it seem almost credible. Despite the ending, which it’s useful to be forewarned of, I thought this sounded quite good. Lovely cover too. I’ll keep a look out for it. Did you read Paullette Jiles’ News of the World by any chance? Yes, I did read ‘News of the World’ by Paullette Jiles. That is an excellent classic Western and made my Top 12 list for last year. I wouldn’t call ‘West’ a classic Western, but it is an interesting comparison, both are fine novels that take place in the West in early times and both by women. Both are also economical in style. I hope they are a trend. I just finished this today. I’d forgotten it was you who’d recommended it. I absolutely loved it, including the ending (which of course is far fetched, but I still thought worked well). Thank you very much for putting it on my radar. I’m happy you liked it, Max. ‘West’ and Carys Davies didn’t get much publicity here in the States, so a lot of readers missed it for much lesser books. It was the Guardian that got me aware of this fine novel.